IN NATURE, venom is a perfectly engineered toxin, which enters the body of unsuspecting prey and impairs vital functions, leading to paralysis or, in some circumstances, death. On the big screen, Venom is a toxic origin story torn from the pages of Marvel Comics, which bludgeons the senses of unsuspecting cinemagoers with digital effects, leading to confusion or, in some circumstances, death by boredom. 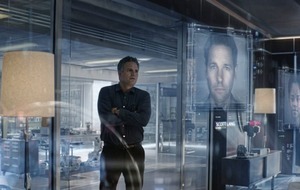 Director Ruben Fleischer's big-budget spin-off from the Spider-Man universe crashes and burns in spectacular fashion as it introduces audiences to one of the webslinger's most fearsome adversaries. The script penned by Jeff Pinkner, Scott Rosenberg and Kelly Marcel lacks compelling characters and is tonally uneven, injecting snarky humour into a bloodthirsty central character with razor-sharp teeth, who gets his kicks by biting the heads off terrified victims. Fleischer's film earns a 15 certificate with graphic violence, fruity language and simulated scenes of fluffy animals being devoured. Tom Hardy, who was mesmerising as Bane in The Dark Knight Rises, is submerged beneath swirling computer-generated trickery as the eponymous alien parasite takes control of his body and goes on the rampage in San Francisco. Oscar nominee Michelle Williams is squandered as a love interest, whose sole purpose is to twiddle one knob on a console in the messy final act. Thankfully, Riz Ahmed brings a tightly coiled menace to his villain, a man of science and questionable ethics, who looks to the stars for humanity's salvation and discovers we are not alone. He plays Carlton Drake, director of the mysterious Life Foundation, who harvests amorphous extra-terrestrials from a comet. The aliens, which Life Foundation christen symbiotes, fuse with their host and slowly devour the body from within. Drake secretly experiments with the symbiotes and homeless human test subjects. 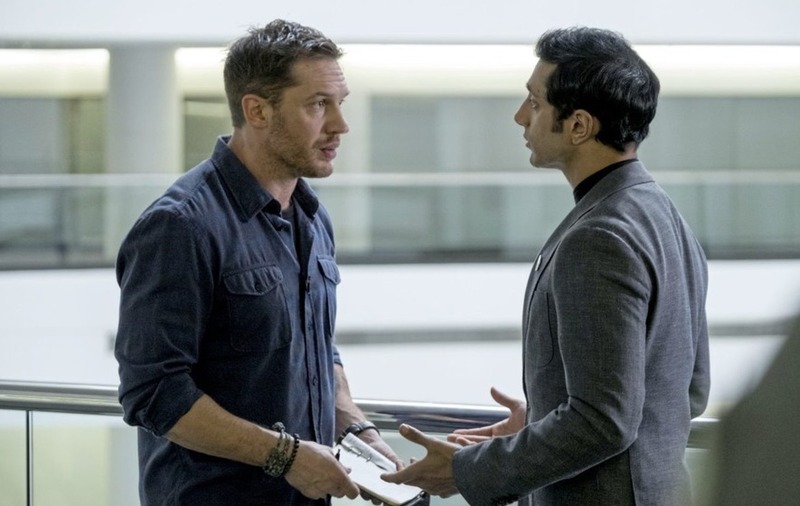 Tenacious journalist Eddie Brock (Hardy), whose girlfriend Anne Weying (Williams) works for the legal firm which represents Life Foundation, investigates Drake and consequently loses his job and the girl. Soon afterwards, one of Drake's research team, Dr Dora Skirth (Jenny Slate), provides Eddie with the proof he needs to expose Life Foundation's dubious morals. 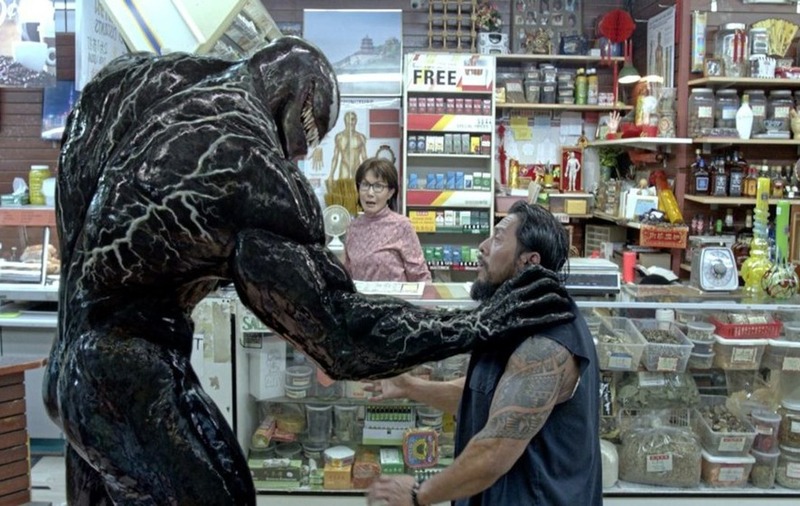 In the process, Eddie has an uncomfortably close encounter with one of the symbiotes and a creature called Venom melds with the reporter's body. "Co-operate and you might just survive – that's the deal," growls the otherworldly parasite, who is looking forward to treating the population of San Francisco as an all-you-can-eat buffet. Venom awkwardly combines an alien invasion thriller with sci-fi horror, a mismatched buddy comedy and doomed romance. Action set-pieces are a bewildering blitzkrieg of digitally rendered destruction that strains eyes and plausibility. The award-winning ensemble cast is powerless to tease subtle emotions from the bombastic sensory overload as director Fleischer works down his Marvel Comics checklist including an obligatory cameo for Stan Lee. The title promises pain and, regrettably, Venom delivers.